This page, featuring public officials, is one of half-a-dozen pages compiling expressions of support for carbon taxes (or more targeted taxes, e.g., on gasoline) by notable individuals and organizations. To access other pages with different supporter categories, click on the Progress link on the navigation bar and move to the desired category. While Obama has not formally proposed taxing carbon emissions, at his Dec. 1, 2015 press conference at the Paris climate summit he argued for pricing carbon emissions in the strongest and clearest terms used by any president to date. In a February 2009 New York Times interview, Secretary Chu said “that while President Obama and Congressional Democratic leaders had endorsed a so-called cap-and-trade system to control global warming pollutants, there were alternatives that could emerge, including a tax on carbon emissions or a modified version of cap-and-trade.” Chu was one of four Nobel prize winners (he was awarded the Physics prize in 1997) to sign CTC’s Paris letter calling upon the UN climate negotiators to endorse national and global carbon taxes. Senator Sanders introduced his Climate Protection and Justice Act last Dec. 9, just prior to the closing of the Paris Climate Summit. We discuss the bill here, but it has been in his presidential campaign that Sen. Sanders has put a carbon pollution tax on the political map, unabashedly championing the idea in the debates and criticizing former Secretary of State Hillary Clinton for not similarly making a carbon tax the centerpiece of her climate program. On taxing carbon: His climate change plan called for a carbon tax that will “tax polluters causing the climate crisis, and return billions of dollars to working families to ensure the fossil fuel companies don’t subject us to unfair rate hikes.” And it aimed for a 40 percent cut in emissions by 2030, compared to 1990 levels — a level of ambition on par with Europe’s. On offshore drilling: The plan also called for ending offshore drilling, for the sake of energy security and the environment. “If we are serious about moving beyond oil toward energy independence, lowering the cost of energy, combating climate change, and cutting carbon pollution emissions, then we must ban offshore drilling,” it read. On climate denial: “The reality is that the fossil fuel industry is to blame for much of the climate change skepticism in America,” Sanders says in his climate plan. In October, he joined those calling for the Department of Justice to investigate ExxonMobil’s climate obfuscation. On Donald Trump’s climate denial: “How brilliant can you be?” mocked Sanders in front of a New Hampshire audience in January. “The entire scientific community has concluded that climate change is real and causing major problems, and Trump believes that it’s a hoax created by the Chinese. Surprised it wasn’t the Mexicans.” Trump, for his part, has a history of flip-flopping on climate. On the Paris climate agreement: “While this is a step forward it goes nowhere near far enough. The planet is in crisis. We need bold action in the very near future and this does not provide that,” said Sanders in December. Clinton’s campaign chair John Podesta later used this statement to argue that Sanders wanted to back out of the Paris Agreement. On keeping it in the ground: In November, he cosponsored the Keep It in the Ground Act of 2015, which would halt new coal leases on public lands and prohibit drilling on the outer continental shelf. On Nov. 19, 2014, Senator Whitehouse, famous for his weekly floor speeches about the dangers of global warming, introduced the American Opportunity Carbon Fee Act which would impose a $42 per ton carbon tax, increasing annually at 2% above inflation. Senator Whitehouse’s price trajectory follows the Obama Administration’s central estimate of the “social cost of carbon,” the value of the harms caused by carbon pollution including falling agricultural productivity, damages to human health, and property losses from flooding. The fee would be assessed on all coal, oil, and natural gas produced in or imported to the U.S. and also cover large emitters of non-carbon greenhouse gases and carbon dioxide from non-fossil-fuel sources. Senator Whitehouse spoke at length about this legislation on the Senate floor in introducing it. Video of his remarks can be seen here, and text is available here. Senator Whitehouse re-introduced an updated version of his proposal in May 2015, which raises the initial tax level slightly, to $45 per ton of CO2. On Earth Day 2015, Rep. John Delaney introduced a discussion draft of his “Tax Pollution, Not Profits Act” that would establish a tax of $30 per metric ton of carbon dioxide or carbon dioxide equivalent, increasing each subsequent year at 4% above the rate of general inflation. Delaney’s proposal would apply revenues to reduce the corporate tax rate to 28%, provide monthly payments to low-income and middle-class households, and fund job training, early retirement and health care benefits to coal workers. In a welcome sign of fresh thinking, Rep. Henry Waxman, ranking member of the House Energy and Commerce Committee and co-author of the the American Clean Energy and Security Act, a proposed cap-and-trade measure that passed the House in 2009 but failed in the Senate, began seeking public input on a proposal for a much simpler carbon tax in early 2013. With Republicans (many of whom are climate science denialists) wielding the gavel in the House, Waxman’s initiative hasn’t made headway. But Waxman’s shift does seem to bode well for future efforts to enact simple, transparent carbon taxes without the gimmicks of complex cap, trade and offset schemes. Rep. John B. Larson, an 8th-term representative from Hartford, introduced his American Energy Security Trust Fund Act in August 2008 with twelve co-sponsors. His bill would impose an upstream tax on emissions of carbon dioxide of $15/ton with the level increasing by at least $10/ton annually. CTC estimates this trajectory would reduce U.S. CO2 emissions by 1/3 within a decade. Larson proposes a tax shift, using carbon tax revenue primarily to rebate payroll taxes. Here is CTC’s commentary on the Larson bill and here is the bill. Larson sponsored and kicked off CTC’s 2008 House briefing on Carbon Taxes. Conservatives don’t support tax increases that are veiled as “cap and trade” schemes for pollution permits. But offer us a tax swap, and we could become the new administration’s best allies on climate change. A climate-change bill withered in Congress this summer because families don’t need an enormous, and hidden, tax increase. If the bill’s authors had instead proposed a simple carbon tax coupled with an equal, offsetting reduction in income taxes or payroll taxes, a dynamic new energy security policy could have taken root. As long as national security risks aren’t factored into the cost of gasoline and as long as carbon dioxide can be emitted without penalty, oil will continue to have an advantage over emerging fuels in the marketplace, and we’ll continue our ruinous addiction to it. We need to impose a tax on the thing we want less of (carbon dioxide) and reduce taxes on the things we want more of (income and jobs). A carbon tax would attach the national security and environmental costs to carbon-based fuels like oil, causing the market to recognize the price of these negative externalities. It is essential … that any taxes on carbon emissions be accompanied by equal, pro-growth tax cuts. A carbon tax that isn’t accompanied by a reduction in other taxes is a nonstarter. Fiscal conservatives would gladly trade a carbon tax for a reduction in payroll or income taxes, but we can’t go along with an overall tax increase. The good news is that both Democrats and Republicans could support a carbon tax offset by a payroll or income tax cut. Two carbon tax bills introduced in House Ways & Means (tax-writing committee) embodied much of what Rep. Inglis advocated in his op-ed: Stark-McDermott, filed in April 2007, and Larson, filed in August. (More details on our Bills page.) Rep. Inglis now chairs republicEn, (formerly the Energy & Enterprise Initiative at George Mason University) and is a vocal and effective advocate for a revenue-neutral U.S.carbon tax. The question is not if human activity is responsible for global climate change, but how the United States will respond,” said Stark. “Predictable, transparent and universal, a carbon tax is a simple solution to a difficult problem. It would drastically reduce our carbon dioxide emissions by providing an economic disincentive for the use of carbon-based fossil fuels and an incentive for the development and use of cleaner alternative energies. The Save Our Climate Act would establish the United States as a global leader in environmental protection and encourage other nations – most of whom have already acknowledged the climate change threat – to take similar action to reduce emissions. 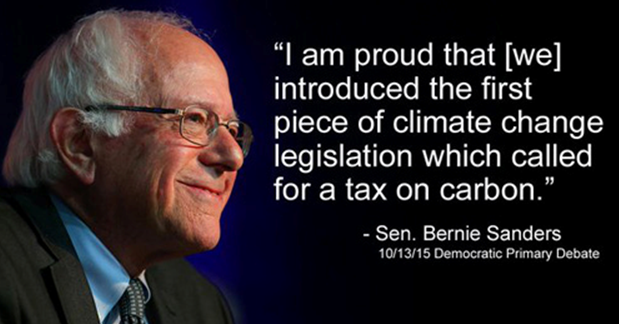 I strongly encourage Congress to pass a carbon tax. CTC reported on the Stark-McDermott bill here. In a rousing speech in Seattle in November 2007, which he recapitulated a month later at the UN Framework Conference on Climate Change in Bali, New York City Mayor Michael R. Bloomberg vaulted to the head of the class of public officials supporting carbon taxes. As noted on our blog, the mayor’s speech put Bloomberg alongside former Vice-President Al Gore as the nation’s leading advocate of a carbon tax to cap and reduce carbon emissions from fossil fuels. Bloomberg could not have been more forceful on the need to price carbon emissions, the superiority of carbon taxes over cap-and-trade schemes, and the need for political leadership at this crucial time. Gore voiced this theme in an historical context in a March, 2008 talk at Autodesk: “Here’s the solution. We need a CO2 tax, revenue-neutral, to replace taxation on employment, which was invented by Bismarck — and some things have changed since the 19th Century.” (This is at around the 13:30-minute mark of his talk). [T]he reality of the danger we are courting has not been changed by the discovery of at least two mistakes in the thousands of pages of careful scientific work over the last 22 years by the Intergovernmental Panel on Climate Change. In fact, the crisis is still growing because we are continuing to dump 90 million tons of global-warming pollution every 24 hours into the atmosphere — as if it were an open sewer. Carbon taxes would be a better response to the risks of global warming than emissions caps and tradable permits (commonly referred to as cap-and-trade)… [Carbon taxes] are much less vulnerable to evasion and market manipulation, providing a more stable and transparent system for consumers and industry alike. [Carbon taxes] do not create the price volatility and administrative problems associated with cap and trade. In a June 2008 follow-on study, Addressing Climate Change Without Impairing the U.S. Economy: The Economics and Environmental Science of Combining a Carbon-Based Tax and Tax Relief, Shapiro calls for a federal carbon tax starting at $14 per metric ton of CO2 in 2010 and rising steadily to $50 in 2030 (equivalent to $82 with inflation). Shapiro concludes that the nearly revenue-neutral carbon tax would reduce CO2 emissions by 30% below non-taxed levels while shaving only eight-tenths of one percent off future (2030) GDP. The report was published by the U.S. Climate Task Force, a project of Shapiro’s Sonecon economic advisory company. What may happen to the dollar, and what may happen to growth in China or whatever pale into insignificance compared with the question of what happens to this planet over the next 30 or 40 years if no action is taken… The scientists seem pretty well agreed that [global warming] is still potentially manageable if we act decisively, beginning now into the next decade or so, by taking measures that are technically and economically feasible. Mr. Shultz, U.S. Secretary of Labor under Pres. Nixon (1969-70), Treasury Secretary under Presidents Nixon and Ford (1972-74), and Secretary of State under Pres. Reagan (1982-89), a consummate member of the Washington establishment, co-chairs a task force at Stanford that is urging Republicans to support a carbon tax. (See Stanford’s George Shultz on energy: It’s personal, Stanford Report, July 2012). The use of economic incentives (caps and trading rights, and carbon taxes) is essential to avoid disastrously high costs of control. The cap-and-trade system has been highly successful in reducing sulfur dioxide emissions by electricity utilities in the United States. That system relies on a scientifically valid and accepted emission-measurement system used by a clearly identified and homogeneous set of utilities. Fortunately, such a careful system of measurement exists for a viable greenhouse gas regimen. The product of collaboration between the World Resources Institute and the World Business Council for Sustainable Development, these standards for accounting and reporting greenhouse gases should be duly understood and adopted. Even with clear units of account, however, large problems arise as the coverage and heterogeneity of the system grow. And for trading across borders, the system needs to be accepted among the trading partners. Scams are easy to imagine. No nation should be allowed to trade without a verifiable, transparent system of measuring and monitoring of reductions, and holding emitters accountable. In many respects, a straight-out carbon tax is simpler and likelier to produce the desired result. If the tax were offset by cuts elsewhere to make it revenue-neutral, acceptability would be enhanced. Click here for links to the many pro-carbon tax articles and blog posts by President George W. Bush’s chief economic adviser, 2003-2005. Mankiw, who teaches at Harvard, is the convener of the “Pigou Club” which he describes as an elite group of of economists and pundits who support taxing pollution instead of productive activity. We also need to change our tax system to reduce our oil dependence. In general, we ought to reduce taxes on things we need, such as wages, and raise taxes on whatever is dangerous to us, such as pollution and resource depletion. We could implement a $1 per gallon gasoline tax; or an equivalent carbon tax … After a few years of adjustment in the case of a gasoline or carbon tax, cars would be more fuel-efficient, so consumers would pay what they used to pay for the same amount of driving, and the broad middle class would continue to pay lower employment taxes. The result would be increasing demand for goods and services; shrinking dependency payments such as unemployment compensation and welfare; lowered social costs, such as crime and avoidable illness; and a more equitable tax system that encourages rising employment.